The links below were added when USA version wasn't available. Dragon Ball European Version is now available. 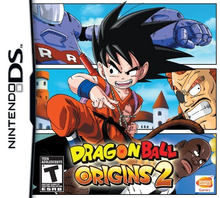 Note: Copy any of the above Dragon Ball: Origins 2 (USA) rom download links and paste it into your browser to download. They aren't creating a rom....They are going to upload a rom that was cracked by a release group named Venom. So they download it from someone else, post it here, and then we download from them. same on m3 ds real,after i enter my name,i carnt start the game???? Dragon_Ball_Origins_2_EUR_NDS-BAHAMUT is out and the same thing happens. The MediaFire link does not function properly. It says "ND5 file" whatever that is. I hope the MegaUpload file works. NO WORKS ON WOOD 1.09 !!!!!!! how do we get the cracked version to work? i have tested all the games ive downloaded many dragon ball origins 2 games it doesnt work on no$gba please is there a code to get it working like in pokemon soulsilver and heartgold?? USA version is not working on AKAIO 1.7 (Does the same as the Eur rip) just Loops at New game Screen. For people wanting to play this in English Try this version. I use an acekard 2i on AKAIO 1.7 and it still doesn't work! none od the files written here works on NO$GBA please some one make a rom that works on NO$GBA and DOES NOT LOOP! Dude, you're getting the games free, go and buy a DS with a flashcart, NO$GBA hasn't been updated in 2 years, it's an abandoned emu full of bugs. which one is the dapope release?